The following tips, tricks and troubleshooting offer solutions to problems and situations that can arise when the Qlik Connectors are used in complex production environments. Most of solutions offered here derive from real situations encountered by customers. Many of the points made below are also covered in the online help for individual connectors. They are collected here for easy access when issues arise. Kerberos authentication is not supported in the Apache Hive Connector contained in the ODBC Connector Package. Failure to connect to a Microsoft SQL Server can be caused by TCP/IP setting in the server. The error message from the Microsoft SQL Server Connector indicates other properties, such as user name, password, host name might be incorrect. But the connection can fail even when those properties are correct. The properties can be verified by connecting through OLEDB or ODBC DNS. If those connections succeed, then the problem might be caused by the TCP/IP setting in the server. Ensure that the host name is discoverable on the network. Execute nslookup sift0035 in the command prompt. If the host can be discovered, nslookup will return a valid name and IP address for the server. If sift0035 is an SQLExpress instance, by default it may not listen on port 1433. Check the SQL Server settings to confirm the correct port. More information on SQLExpress can be found at http://razorsql.com/docs/support_sqlserver_express.html. When loading a table from Oracle using Qlik Sense June 2018 (ODBC Connector Package 5.2), many rows show empty values in most columns. This does not happen in Qlik Sense February 2018 (ODBC Connector Package 4.0). The MEMLIM parameter sets the size of the buffer the ODBC driver uses for data retrieval. The value is specified in bytes. The minimum value for the buffer size is 32 KB. The recommended setting is 2,000,000 bytes (approximately 2 MB) to address this issue. Query Bands can be added to a Qlik Teradata connection. Query Bands and the SQL QUERY_BAND statement are explained in https://downloads.teradata.com/sites/all/files/Informatica%20and%20Query%20Banding.pdf. 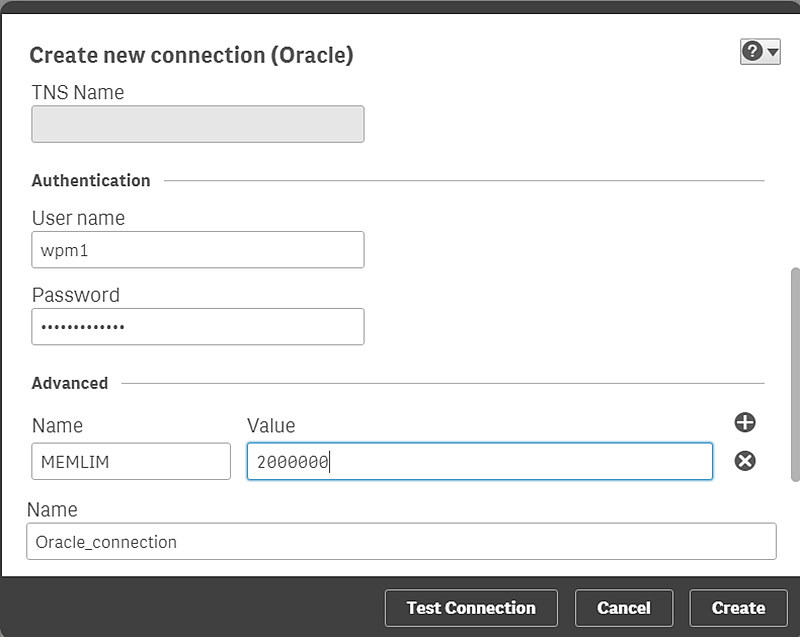 The following document contains an illustration that shows how the QlikView Essbase Connector connects to an XMLA Provider for Hyperion Essbase that then connects to the Essbase Server. In an environment that requires all requests go through a forward proxy, the REST Connector requires additional configuration before connections can be made. The proxy settings must be added between <configuration> and </configuration>. 172.16.16.102 represents the proxy server IP address and 8888 is the port to connect to the proxy server. For other possible settings, see https://msdn.microsoft.com/en-us/library/kd3cf2ex(v=vs.110).aspx. The setting can also be set for all applications using .NET framework by modifying the file machine.config, located in C:\Windows\Microsoft.NET\Framework64\vX.X.XXXXX\Config. X.X.XXXX is the version number for the .NET framework installed. This proxy configuration procedure can be used for other connectors included in Qlik Sense Enterprise for Windows hub: ODBC Connector Package, Salesforce Connector, and DataMarket Connector. When the Salesforce Connector is used in two different QVWs, one of the QVWs fails to load when the two are run at the same time. Salesforce allows only one connection at a time. Stagger the reloads so that they do not occur at the same time. There is a connection failure and the scheduler automatically creates a batch job for such connection failures. Application explicitly asks for batch job creation by calling the API START_OF_BACKGROUNDTASK in the same flow that creates the queue entry. The job RSARFCSE is responsible for asynchronous remote function calls that have not been successful. For every unsuccessful ARFC found in table ARFCSSTATE a job called ARFC:<xxxxxxx> is created. In table ARFCSSTATE you can see the destination for the ARFC call. The job will be created if there is a connection failure and the scheduler automatically creates a batch job for such connection failures. So if the tRFC call is in status CPICERR, then the entry will be retried as per settings in tRFC options. If you do not see CPICERR status and instread see SYSFAIL status, then there will not be any automatic retry. Once you have determined the target system for the ARFC calls (as per table ARFCSSTATE), use transaction SM59 to check whether this is a valid RFC destination. In the screen that follows, select Suppress background job if conn.error. Note: This option only works in the case of the first case listed above. If the application explicitly asks for the batch job, then there is no reason to suppress the background job. The RFCs can then be reprocessed by scheduling report RSARFCEX. You can also delete the already scheduled jobs with report RSBTCDEL if there are too many. Using the option Suppress background job if conn.error stops the creation of these ARFC:<XXXX> background jobs. You can then reprocess the failed tRFC calls by scheduling report RSARFCEX at regular intervals. In the second case listed above, these batch jobs are also created if the application explicitly asks for batch job creation by calling the API START_OF_BACKGROUNDTASK in the same flow that creates the queue entry. To see this, check the ARFCSSTATE tables's ARFCRESERV field. There you would see the BATCHPLA flag set (ARFCRESERV is a continuous string, BATCHPLA flag corresponds to the offset as per ARFCRESERV structure (you can open ARFCRESERV in transaction SE11 to see this)). If this is the case, the issue must be checked with the corresponding application. If you get the error message Connection does not exist when trying to activate an Extractor in transaction /n/QTQV/ACTIVATE, it is because the Logical system environment has been damaged. Create a new Logical system environment in transaction /n/QTQVC/EXTRACTOR_ADM with a name that has not been used before. Try to activate the Extractor with the new Logical system. The OLAP Connector has the limitation: It cannot handle Hierarchy Selection variables in the select dialog in QlikView. Recreate the BEx query in SAP Query Designer with static filters for the desired hierarchy to get around the variables issue. Manually modify the variables section in the load script in QlikView. When entering values for Hierarchy Selection variables in the select dialog of the OLAP Connector, the selectable values are not correct. The value selection list shows all leaves of the InfoObject instead of the available hierarchies. The same behavior occurs when selecting values for a Hierarchy Node variable that is dependent on a Hierarchy Selection variable. The variable names of these will be entered correctly into the script but the variable values will not be correct. If you are modifying the load script, you must know the SAP technical name of the hierarchy and the hierarchy node. 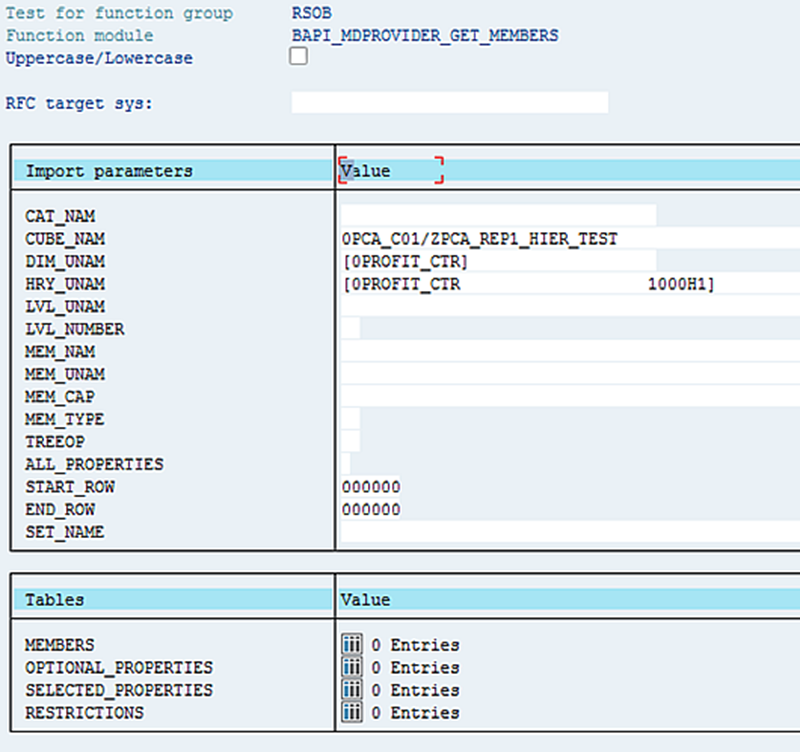 These names can be retrieved by calling function modules in SAP, transaction SE37, or by calling the same function modules using the Qlik SAP BAPI Connector. Hierarchy: Call function module BAPI_MDPROVIDER_GET_HIERARCHYS with the input parameters CUBE_NAM = <InfoProvider>/QueryName> and DIM_UNAM = [<infoObjectName>]. The result is displayed in the table HIERARCHIES, column HRY_UNAM. Copy the content of the column to the Hierarchy Selection Variable. Keep the blank spaces between 0PROFIT_CTR and 10000H1. Hierarchy node: Call function module BAPI_MDPROVIDER_GET_MEMBERS with the input parameters CUBE_NAM = <InfoProvider>/QueryName> and DIM_UNAM = [<infoObjectName>] and [<InfoObjectName> <HierarchyName>] (retrieved in the previous call to BAPI_MDPROVIDER_GET_HIERARCHYS). The result is displayed in the table MEMBERS, column MEN_UNAM. Copy the content of the column to the Hierarchy Node variable, retaining the blank spaces. This indicates that more authorization is required. Compare SAP not 2212180. An SAP query might check authorization objects that are not part of the Qlik roles. In that case, they can be added to the role QTQVCACCESS or added to an additional customer-developed role that is assigned to the Qlik SAP user. A user with SAP_ALL authorization can be used to verify that it is an authorization problem. Currency values are stored in the SAP database in fields with the data type CURR (stored as data type DEC with two decimals). However, not all currencies use two decimals. To handle currencies that do not use two decimals, first find the corresponding currency key. For example, in the database table VBAP there is a currency field NETWR and the corresponding currency is found in the field WAERK. Check to see if the currency key is present in the database table TCURX. The number of decimals used for the currency is stored in the field CURRDEC. If it is not present in the table, the currency has two decimals and no conversion is necessary. If the number of decimals = 0, multiply the value of VBAP-NETWR with 100. If the number of decimals = 1, multiply the value of VBAP-NETWR with 10. If the number of decimals = 3, multiply the value of VBAP-NETWR with 0.1. If the number of decimals = 4, multiply the value of VBAP-NETWR with 0.01. Num(NETWR,'########.##') as [Value], //Format the field so that it looks like the default format with 2 decimals in SAP. //Join the currency table onto the table where you want to process a currency field. The table TCURX can be changed from the transaction OY04 or use transaction SM30 with table TCURX and press the Customizing button. Note: It is not recommended to have the Trace activated all the time because it has a negative effect on performance. Also, note that database records are created in the Qlik database table /QTQVC/TRACE. For a SELECT of 10,000 records, using a PacketSize of 600, about 1-- trace records re created. Therefore, a Trace might not be suitable for SELECT statements that result in a very large number of records. You can delete old Trace records from the database by using the transaction /n/qtqvc/delete in the SAP system. Starting in version 6.3.0, it is also possible to delete records in the background by using transaction /n/qtqvc/delete_bgd. This transaction is suitable for use when deleting a large number of records. Find the Jobnumber in the SQL Connector log. Go to the first screen of transaction SE16, enter the Jobnumber in the field JOBNUMBER and click Execute. Enter a large value in the field Maximum No. of Hits to avoid limitations in the number of displayed records. For example, 2500. Also, enter a large value in the field Width of output list to be able to view all columns. For example, 20000. Sort the TIMESTAMP column in ascending order. O = Open stream (the function module that performs the first steps in each job). B = Batch job (the program that does the fetch of data from the database). F = Fetch stream (the function module used to get the data and send it to Qlik. You can now analyze the information in the Trace records and save the records in a spreadsheet, using the System menu (List > Save > Local File). The connection string properties can be useful for modifying the behavior of the connector. For example, to get a preview of the resulting records of a SELECT statement, set the properties FetchBuffers=1 and PacketSize=100. This will fetch 100 rows when the statement is reloaded. This error indicates that the size of the shared export/import buffer in the SAP system might be too small. Check the size value in transaction RZ11 for the parameter rsdb/obj/buffersize . The recommend size can vary depending on the SAP system. As a reference, a Qlik test system has the value 83876. The SAP BASIS team can increase the value if it is too small.